It's my turn to share my block and offer some great prizes for hanging out with me! 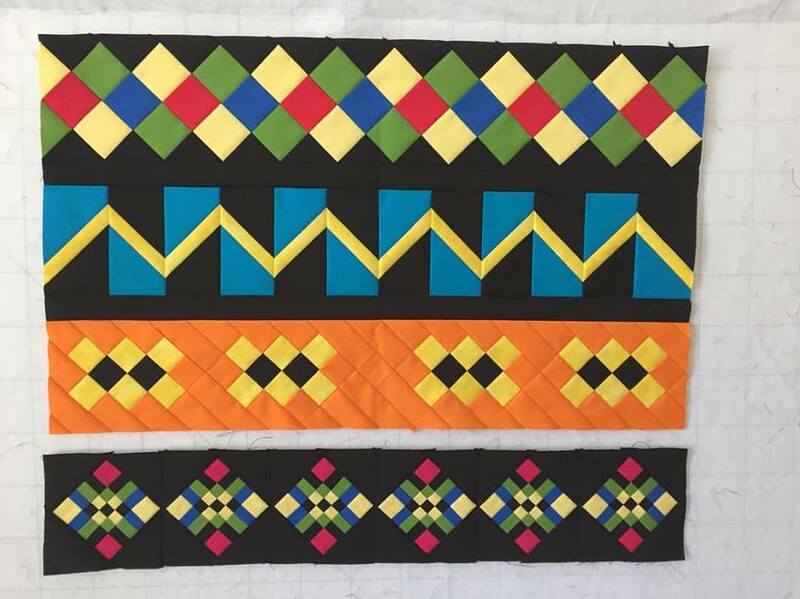 My block is called Zig Zag and is just a little different than the incredible blocks posted by Barb, Donna and Kelly! I paper pieced this block to make all those half square triangles easier to piece and more accurate. You can download the foundation pattern HERE. Here is the rotary cutting directions for the block center. cut (1) dark blue square 2-5/8" x 2-5/8"
cut (2) black flower print squares 2-5/8" x 2-5/8"
cut (2) black flower print rectangles 2-5/8" x 6-7/8"
This completed square should measure 6-7/8" square. Pre-cut pieces for foundation piecing. The dimensions provided below in the list are 1/2" - 1" larger than the actual rotary cut patches, to allow for trimming. Cut apart the foundation patterns. On the unprinted side label each patch with the fabric color. Compare to the block photo for reference. Remember: the printed side of the foundation is the REVERSE of the actual block. Take a cream print (F) and a red print (E) triangle right sides together. Position them on the unprinted side of the small foundation paper (shown on top in the photo above) so that the cream print is underneath and the red print on top. Position over the cream print triangle spot so that there is at least a 1/4" or more of fabric around all sides. Pin in place from the printed side of the paper. Hold up to a lamp or window to check placement. Stitch on the line between the cream and red triangles. Sew a few stitches into the adjoining spaces. 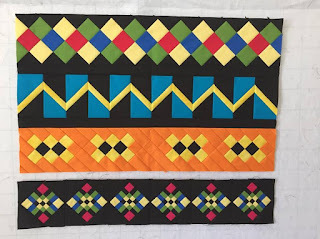 Reduce stitch length when foundation piecing. Clip threads and turn the paper over and press the red triangle open. Fold the paper back on the line between the cream triangle and the next triangle (light blue) using an Add A Quarter Plus Ruler (or a note card). Pull back the stitched fabric corner with a good swift tug. Place the Add A Quarter Ruler's 1/4" raised edge along the paper fold. Trim the fabric along the ruler. Place the next triangle (light blue) face down on the cream triangle, aligned with the newly cut edge. Position the blue triangle so that when it is sewn and flipped it will completely cover the triangle on the paper. Sew the light blue triangle in place on the printed side of the foundation. 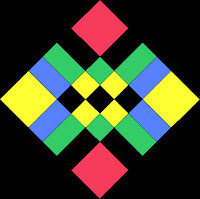 Fold the light blue triangle back and press. Continue to add fabric patches to the foundation until all triangle patches are covered. Trim and add the dark blue rectangle. Stitch and flip the dark blue rectangle. Then add the cream triangle corner patch (A). Press the whole foundation and then trim the pattern on the cutting lines. Be sure to leave 1/4" beyond the stitching lines!! Complete the remaining foundation patterns. Press and trim as shown above. Now sew the two smaller foundations to either side of the center square you made first. Match seams. Remove the foundation paper from the back of the sections once you sew them into the block. If you choose to leave the paper on until you are done, at least remove the paper from the seam allowance to make pressing easier. Press the seam allowance toward the center square. Foundation piece the remaining sections of the block. Be sure to label each patch with the fabric color on the unprinted side of each foundation pattern. Trim the corners of each large pieced foundation as shown on the paper. This will make lining up easier. Stitch the triangle sections to the main section of the block matching seams and ends. Press the seam toward the triangle sections. Here is the completed Zig Zag Block! 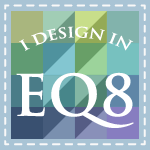 If you have EQ7 you can download the EQ7 File HERE. Be sure to save the file first and then open it in EQ7. If you’re ready to continue the hop, then head over to Inspired by Fabric and sign up to follow their blog (either by email or blog reader). You will be entered to win Vintage Shirtings Fabric Bundles! Then, come back here and let me know you’re signed up by either leaving a comment below OR leaving a comment by contacting me. Also in your comments, let me know how you would use this block in a project. By doing so you will be entered to win any 3 Morning Glory Designs Patterns of your choice!!! Be sure to include your email address so we can contact you if you win! The drawing for my patterns will take place next week. Here are the list of bloggers for the Vintage Shirting & Dress Print Blog Hop. 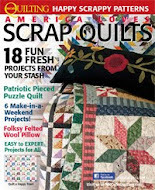 Be sure to collect all the blocks from these talented quilt-makers! !